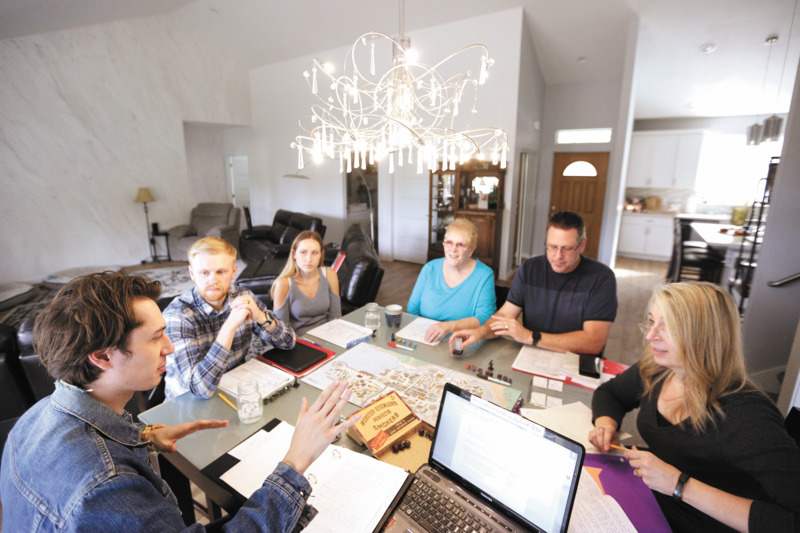 The Adrian family plays Dungeons & Dragons in their Spokane Valley home. On a late summer morning, the Adrian family is investigating a cultist hideout when a fight breaks out. "I'm actually gonna take my great axe, but not with the blade, and try and knock him unconscious," says Joel Adrian, role playing as a towering barbarian named Gehl. A 20-sided black die with bright red numbers clatters across the table. "Eighteen, plus seven to hit." "Yeah, go ahead and roll damage," says his son Josh, who's leading this session of Dungeons & Dragons as the all-knowing dungeon master. Josh stands up and raises his arms aloft to gesture the wide swing of Gehl's great axe and how much damage, determined by the dice rolls, his dad's character does to the enemy at hand. "Gehl spins his axe and — boom! — hits him," Josh narrates. "Then Nieran runs around and spins and pulls out his longsword." The cultists don't stand much of a chance against the hulking barbarian and one of his companions, a stealthy and fast dark-elf rogue played by the dungeon master's brother-in-law, Kolby Wade. Also gathered around the kitchen table are Josh's mother, Carrie, grandmother Reggie and sister Kayla. After the round of combat concludes in victory for the group of adventurers, the family of six takes a midday break for tuna melts and tomato soup. Though the outcomes of this particular role-playing narrative will be utterly unique, the Saturday morning gathering of imagination and adventure is not. In an age when technology-driven entertainment has never been better — from blockbuster video games and virtual reality to the spectacular imagery of major film and television franchises — people are increasingly choosing their kitchen tables over screens to find creative, engaging escapes. As part of that trend, Dungeons & Dragons, the role-playing game of swords and sorcery first published in 1974, has returned to the spotlight of gaming culture at an unprecedented level. Indeed, 2018 is on track to become the biggest year for Dungeons & Dragons, according to its publisher Wizards of the Coast, a Renton, Washington-based subsidiary of the toy behemoth Hasbro. "While we can't share specific sales information, we can say that 2017 was a record-breaking year for D&D, and 2018 is going to beat it handily," says Greg Tito, Wizards of the Coast's communications manager. "One of the strongest indicators that the D&D audience is still growing is that introductory products like the Player's Handbooks and Starter Sets were some of the bestselling of 2018," Tito continues. "That means more people are getting into D&D for the first time." Dungeons & Dragons' modern resurrection reflects what's being seen in tabletop gaming as an industry, which includes board and trading card games. According to geek culture market tracking firm Internal Correspondence, sales of such games topped $1.5 billion in the U.S. and Canada for the first time in 2017, an increase of 8 percent over the previous year. Of the various gaming sub-genres the firm tracks, role-playing games were up last year by 22 percent, from $45 million to $55 million. Future projections for the global board game market expect this trend to continue, with a projected overall growth rate of 23 percent between 2018 and 2022. The Adrian family began playing D&D in May this year, meeting once or twice a month since to solve mysteries, battle evil foes and seek out treasure in a custom story written by Josh and set on a fictional island called Coras. "I think what is becoming popular again is being together and spending time together versus playing video games or being online." 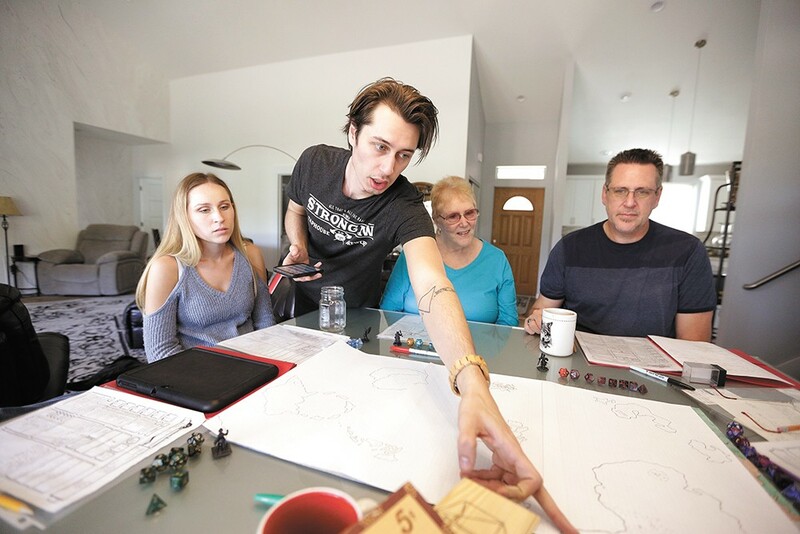 Though D&D has been a passion of the 26-year-old for several years now — he also plays with friends at least once a week — he says it didn't take too much convincing to get the whole family to play, including his 73-year-old grandmother. "We really, as a family, like adventure movies — the Marvel movies, The Lord of the Rings, The Hobbit — all that stuff," says his mom, Carrie. "We read Harry Potter as a family when the kids were young. So [Dungeons & Dragons] just seemed like a fun way to do something similar to that; a storytelling kind of thing." Other members of the Adrian family point out that this newfound interest in D&D has resulted in them spending more time together, and having more meaningful interactions. "I think what is becoming popular again is being together and spending time together versus playing video games or being online," notes Kayla, Josh's sister. All of those major film and book franchises Carrie lists, and many more, are widely credited for helping to bring Dungeons & Dragons back into the broader pop culture lexicon. With its limitless creative bounds and high-fantasy settings and characters — the game is packed with imaginary beings from wizards and elves to orcs, goblins, dwarves and fearsome monsters — D&D offers a familiar tone for existing fans of the genre. And while the game follows a basic set of rules and play structure, it's infinitely customizable when it comes to narrative, setting and character behavior. Once a game begins, and as the dungeon master narrates what players encounter in a scenario, players around the table — each role playing as a unique character they've created based on D&D's rules and options — take turns asking questions of the dungeon master or explaining what their character wants to do. The outcomes of these decisions are determined by dice rolls with the dungeon master ultimately determining if the rolls warrant an action's success or failure. Dungeon master Josh Adrian, second from left, points out a spot on the game map to his sister Kayla (far left), grandmother Reggie Adrian and dad Joel Adrian. Visually, Dungeons & Dragons can be played using miniature figurines on a large map to help illustrate where each character is located in relation to each other, the in-game environment and, of course, monstrous foes. Players manage and track their characters' abilities and other traits on standardized "character sheets," either digitally or on a printed sheet. "D&D has become so much more than a nerdy game that people play in their basement," Josh Adrian reflects. "It's something that people from every walk of life and age can play. It's a game that allows such freedom. It's so much about player choice and improv and everyone brings something to the table." Further helping Dungeons & Dragons shed its long-held stereotype as a game for outcasts is increased acknowledgement from high-profile writers, actors and other celebrities who grew up playing it in the 1980s and '90s, back when it was generally viewed as a weird hobby of basement-dwelling teens. Game of Thrones' showrunners David Benioff and D.B. Weiss both credit D&D for early exposure to creative worldbuilding. Late-night host and unofficial nerd culture godfather Stephen Colbert also plays and loves to talk D&D with guests like Anderson Cooper and actor Joe Manganiello (True Blood). Manganiello is such a devoted Dungeons & Dragons fan he's built a game dungeon in his Los Angeles home where he regularly hosts sessions with other Hollywood pros, and also owns a D&D-inspired streetwear line called Death Saves. Deborah Ann Woll (Marvel's Daredevil) is also outspoken about her passion for playing, along with fellow actors Vin Diesel, Patton Oswalt, Mike Myers, Matthew Lillard, Rainn Wilson and many more. Another major factor behind the games' resurgence — and one that Spokane-area players repeatedly cited — is the game's appearance in Netflix's acclaimed 2016 supernatural horror/mystery series Stranger Things. The 1980s-set series' plot was largely inspired by Dungeons & Dragons' early editions and its main characters are shown playing it together in the show's very first episode. They spend the rest of the first season battling an alien monster called the Demogorgon, one of D&D's original baddies. Spokane dungeon master — DM for short — and player Irvin Reynolds has noticed other signs of the role-playing game's mainstream revival. 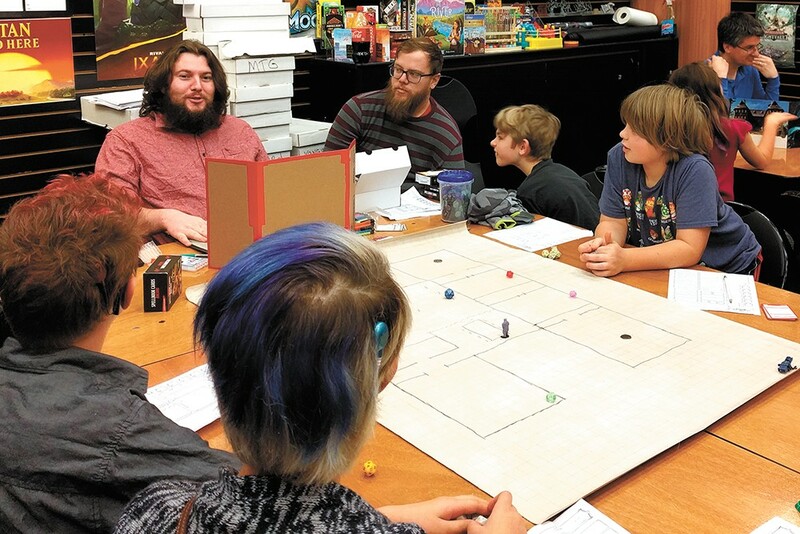 Reynolds runs a weekly Dungeons & Dragons event for kids at Uncle's Games in Spokane Valley. He was first introduced to the game more than a decade ago in high school. One of those signs is a significant increase in D&D-related content in the form of videos, live-streamed shows and podcasts. Dungeons & Dragons' publisher Wizards of the Coast has also taken notice of the game's growing online profile on platforms like the game-streaming service Twitch, noting that in 2017 more than 7,500 unique Twitch broadcasters streamed D&D play, totaling more than 475 million minutes watched. What's important about this trend is that prospective and existing players can see what the game is actually like, from how others role-play their characters to how a dungeon master guides players through a compelling narrative. One of the most popular live-play Dungeons & Dragons web series is Critical Role, featuring a core group of eight professional voice actors adventuring through custom campaigns written and led by dungeon master Matthew Mercer. Each episode clocks in between three and four-and-a-half hours, and Critical Role's first season storyline aired weekly for more than two years before its conclusion. The first episode of the series' current season, which debuted in January 2018, has more than 3.1 million views. It was this series that initially pushed Josh Adrian deep into the world of D&D. "I was always interested in D&D, but never really knew how to get into it or anyone who played," he recalls. "It had always been kind of projected or presented as this really nerdy subculture that seemed unapproachable and a bit daunting. I went home and watched the first episode of Critical Role and immediately was enthralled." Even casual observers who know little or nothing at all about Dungeons & Dragons or its massive modern fandom, however, are taking note of the game's increased presence. "I mean, we have people who show up and they look at what's going on, and then I'll shout out that it's youth D&D league," says Reynolds, the dungeon master at Uncle's Games. "I have a lot of them go, 'Oh, I played that when it first came out; holy cow, I didn't realize it was a thing still!' The amount of people who ask about it and are interested in it, and seem to be wanting to know more, kind of shows me that it's becoming popular." During a recent Saturday morning session he's running for a crowd of kids ages 9 to 15, dozens of shoppers stop and stare at the excited, often raucous group. Reynolds sits at the head of a large table covered with a huge grid map that's strewn with game tokens and a few LEGO mini figures representing the kids' characters. A tri-folded cardboard screen in front of Reynolds intentionally obscures his game notes and dice roll results from the kids to maintain an element of suspense and surprise. Irvin Reynolds, top left, leads weekly D&D sessions for kids at Uncle's Games. Another venue introducing the under-18 set to Dungeons & Dragons is Spark Central, the public learning and technology center in Kendall Yards. There, volunteers and staff from Spokane-based nonprofit RPG Research host twice-monthly drop-in sessions for both D&D and other role-playing games, known as RPGs for short and most of which were modeled after D&D's core design. 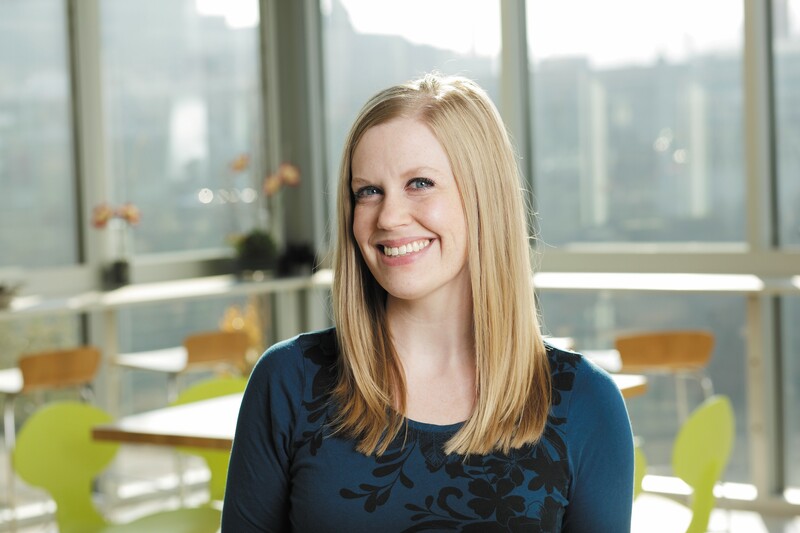 RPG Research founder Hawke Robinson studies the numerous positive effects role-playing games like D&D can have on at-risk youth and mentally or physically disabled populations, among others. In addition to sessions at Spark, RPG Research brings one of its mobile gaming centers, a converted bus and trailer, to public locations around the Northwest on the two Fridays a month its staff are not at Spark. Opportunities like these for new players of all ages to learn how to play and meet other local adventurers is one of the strongest indicators seen in the Inland Northwest of Dungeons & Dragons' modern resurgence. Nearly all of the game and hobby shops in Spokane, Coeur d'Alene and the Palouse host weekly D&D sessions that are usually beginner friendly. Meanwhile, some shops like Uncle's at the Spokane Valley Mall frequently attract more players than there are dungeon masters available to run sessions for them. Before Reynolds can start his custom-written session for the kids that Saturday morning, he's frantically texting a fellow dungeon master to ask if he's on his way. There are already 10 kids eagerly waiting, but to keep the game both manageable for Reynolds and fun for players, he doesn't like to seat more than seven players per table. "It's gotten so popular, so fast," says Uncle's event coordinator Stephanie Gross, adding that the weekend kids' event has only been running since June. For months after the event started, about three to five kids showed up each week; now closer to a dozen regularly attend. 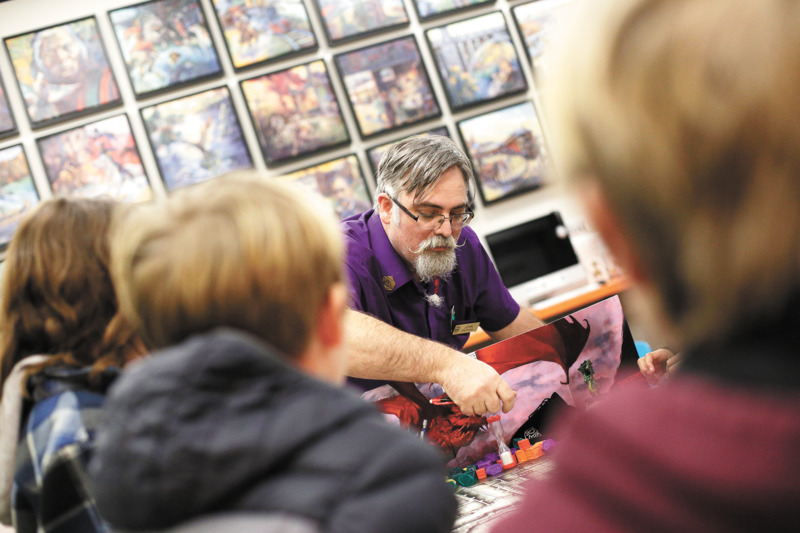 To help match this increased interest from the local community, Gross and Reynolds are also planning to host the store's second "Learn to DM" event early next year to train aspiring dungeon masters in how to run a game. "Honestly, anyone can DM, and anyone can play," Reynolds says. "You don't need to know a lot of the rules to play. You just need to be able to narrate a story that is captivating enough." Like so many players of Dungeons & Dragons, I am also a fan of its closely related fantasy masterpieces — The Lord of the Rings, Harry Potter, Game of Thrones and others. But unlike those precisely defined worlds of literature and film, there's something deeper in Dungeons & Dragons: a shared narrative. I quickly discovered this core principle not long after being introduced to the game early this year while playing with my partner, his brothers and sister-in-law. Sure, we're a bunch of 30-something adults imagining ourselves as other-worldly beings, but we're also cooperating and innovating to solve problems while trying not to get our characters killed. At the same time, we're creating lasting, shared memories that other forms of modern entertainment, no matter how revered, don't provide. Every game of Dungeons & Dragons is, first and foremost, a story its players create. Consider the time our party of adventurers encountered a dangerous dragon sleeping in a high tower. With some ingenuity and allowance from our dungeon master, the group decided to invisibly levitate one of our characters into the air using some magical spells so that she could throw a bag of grenades (an item custom-designed by the DM, as there's nothing on grenades in the official game handbooks) through a window in an attempt to destroy the dragon. It worked, and we still talk about this moment like we actually lived it in the flesh and not just in our imaginations. RPG Research Vice President John Welker leads Dungeons & Dragons sessions for kids twice a month at Spark Central in Kendall Yards. From the perspective of Dungeons & Dragons' creator Wizards of the Coast, this focus on collaborative storytelling is a carefully intentioned design, and a focus of the fifth official re-launch of the game's core rules in conjunction with its 40th anniversary in 2014. Dungeons & Dragons' Fifth Edition rules are simpler and more streamlined than the previous iterations, a move directly credited with boosting the game into its current resurgence. Josh Adrian, the dungeon master who runs games for three generations of his own family, reflects on similar moments of collaborative storytelling in his games with family and friends. 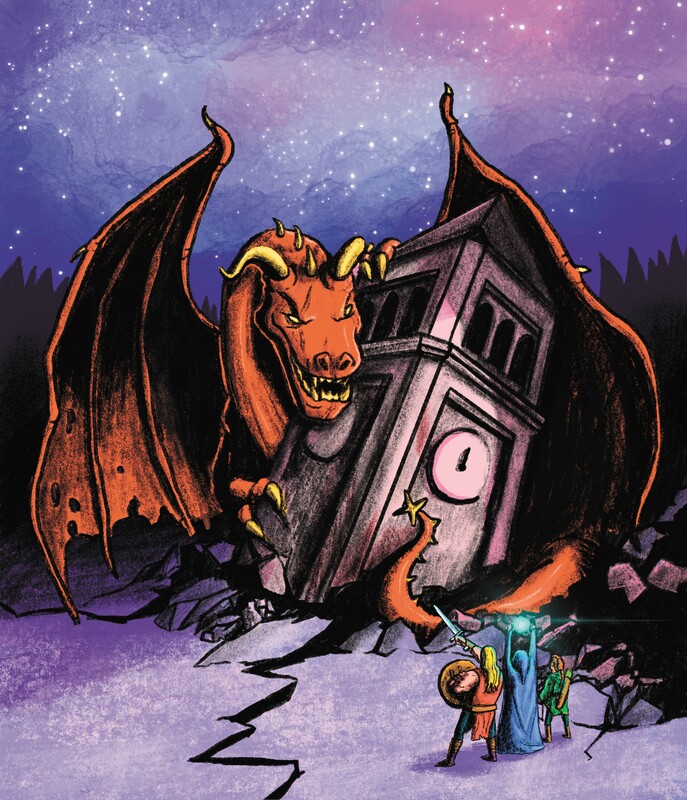 The dungeon master or "DM" leads players through the story-driven game by telling them what they can do, see or hear at given moments; what they encounter and how their actions, usually based on a dice roll, resolve. A 20-sided dice used to randomly determine event outcomes, mainly success and failure. Its counterparts are the d4, d6, d8 and d12. Classes generally define what tasks or skills a character is good at, like investigating, fighting, magic use or healing. The official D&D classes are: barbarian, bard, cleric, druid, fighter, monk, paladin, ranger, rogue, sorcerer, warlock and wizard. Wizards and other magic-wielding classes can only cast so many spells per game "day," and must "rest" to recharge this daily allowance. A story-driven challenge, quest or adventure that can be completed in one or many play sessions. 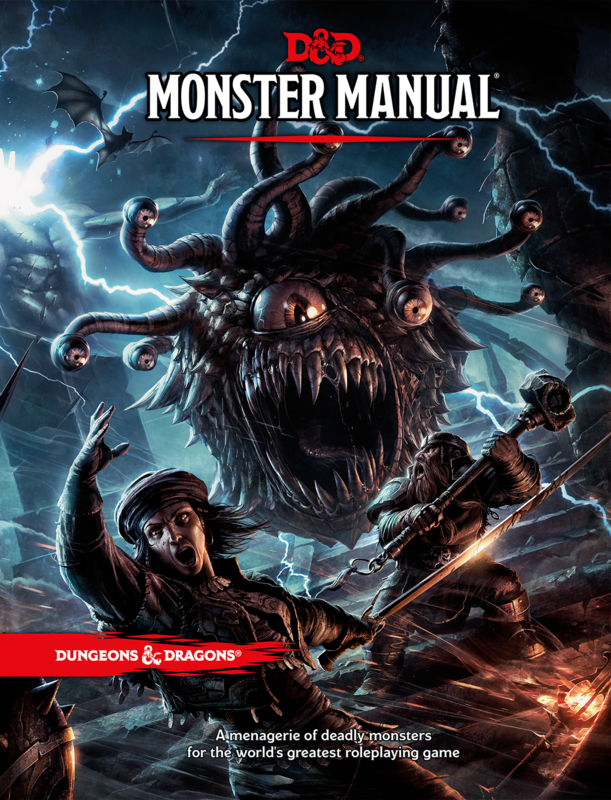 New, official D&D campaign modules are released several times each year as dungeon master handbooks, the newest of which is Waterdeep: Dungeon of the Mad Mage. A custom, player-written story campaign. Homebrews are often entirely new, original stories, or can be based on other works like books, movies, shows or even settings and characters. One of the most fearsome monsters of D&D; this aberration is a large floating eyeball covered with 10 or more "eye stalks" and a massive maw filled with sharp teeth. When a player gets to 0 hit points (HP), they must roll a d20 to determine (at least three times) if their character truly dies or is able to crawl back to the world of the living. Total party kill; when an entire adventuring party is killed by one event or challenge. Defines a creature or character's moral and personal attitude, in the game there are nine alignments ranging from lawful good to chaotic evil. Dungeons & Dragons has beckoned brave and imaginative adventurers since 1974. Take a trip back in time with the new Art & Arcana: A Visual History, a 440-page tome offering a retrospective look at the game’s growth. It’s packed with classic game art, book covers, retro advertisements and other ephemera that’s interspersed with D&D’s definitive history. The book retails for $50 and is a great gift for any D&D fan, new or long-time. Chey Scott currently plays Dungeons & Dragons as a level six human wizard named Neith, a student in the school of necromancy with an undead cat named Mafdet. Chey’s been a nerd her whole life, but before being introduced to D&D she roleplayed Little House on the Prairie throughout childhood. A staff writer at the Inlander since 2012, she’s also the editor of its food and events sections. Contact her at cheys@inlander.com or 325-0634 ext. 225. The original print version of this article was headlined "GATEWAY TO Adventure"